Who is this elusive Lizzie*Kate? Lizzie*Kate is a cross stitch design business that began in 1996. The creator, Linda, was bored with her job and looking for a new creative outlet. 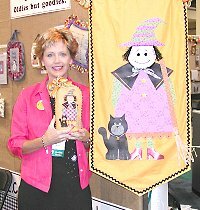 She decided to combine her favorite hobby of stitchery with her past job experience (pre-children) in graphic design. Linda was 40 years old (yikes!) and ripe for a new challenge! In about 6 months, she drew 20 designs, stitched and finished them. As she was readying to exhibit at the annual Charlotte Market in August, she had to pull together all the details to start a new business. One important job was naming her new company! On a whim, she decided to combine the nicknames for her daughters' middle names - Sarah Elizabeth "Lizzie" and Alison Kathleen "Kate" - and Lizzie*Kate was born! She did a rough sketch of how the logo might look, and never had time to revise it. 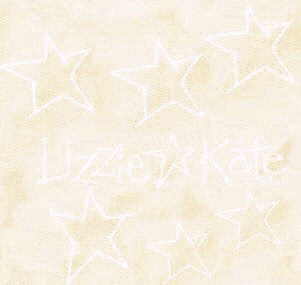 Thanks to kind stitchers around the world, the Lizzie*Kate logo is now well known! Since then, life at Linda's household has not been the same! She was truly blessed (and surprised) to have her designs enthusiastically received at the first market. Linda and her family (husband Alan and daughters Lizzie and Kate) have learned SO MUCH in the past five years. They have developed close relationships with interesting people - the UPS lady, the FedEx guy, the mailman (actually he is not too crazy about the constantly over-flowing industrial-sized mailbox), the printer, photo developer, and on and on! Best of all are the warm relationships with people in the needlework industry - shopowners, suppliers, distributors, and, of course, STITCHERS!!! Our newest experience at Lizzie*Kate is the process of developing this website. For a non-techie like Linda, this has been a real challenge! Thanks to our kind webmaster Mary and patient husband Alan, we are pleased to offer this to you! We thank you for taking the time to visit our site - look around and stay awhile! Please let us know if there is other information that you would like to have included. HAPPY STITCHING FOREVER!